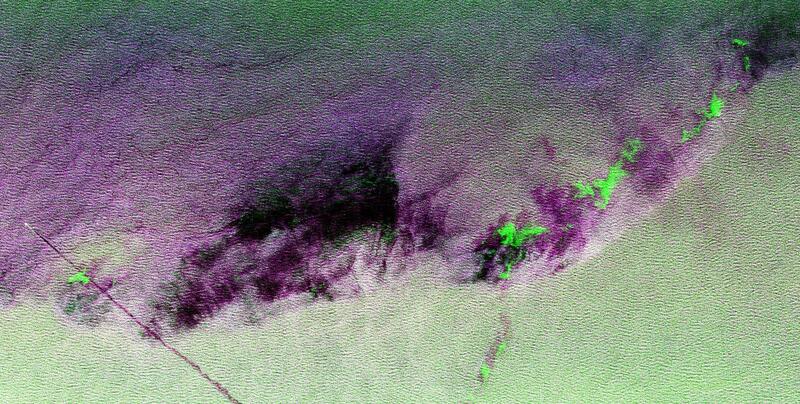 This is a radar image showing surface features on the open ocean in the northeast Atlantic Ocean. There is no land mass in this image. 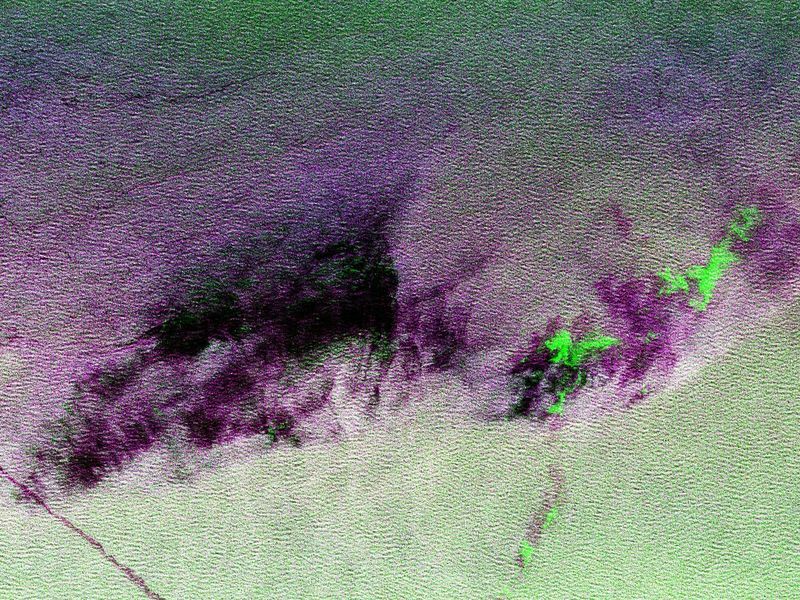 The purple line in the lower left of the image is the stern wake of a ship. The ship creating the wake is the bright white spot on the middle, left side of the image. The ship's wake is about 28 kilometers (17 miles) long in this image and investigators believe that is because the ship may be discharging oil. 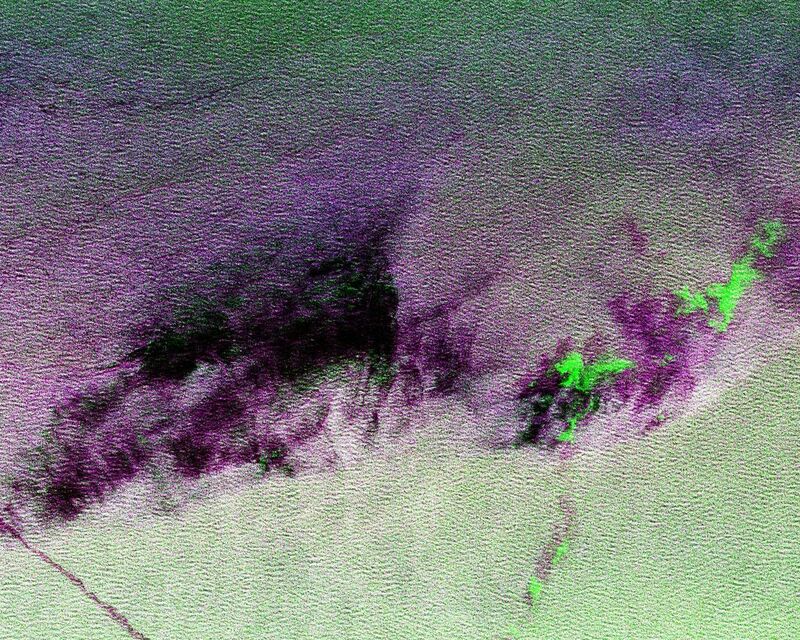 The oil makes the wake last longer and causes it to stand out in this radar image. A fairly sharp boundary or front extends from the lower left to the upper right corner of the image and separates two distinct water masses that have different temperatures. The different water temperature affects the wind patterns on the ocean. In this image, the light green area depicts rougher water with more wind, while the purple area is calmer water with less wind. 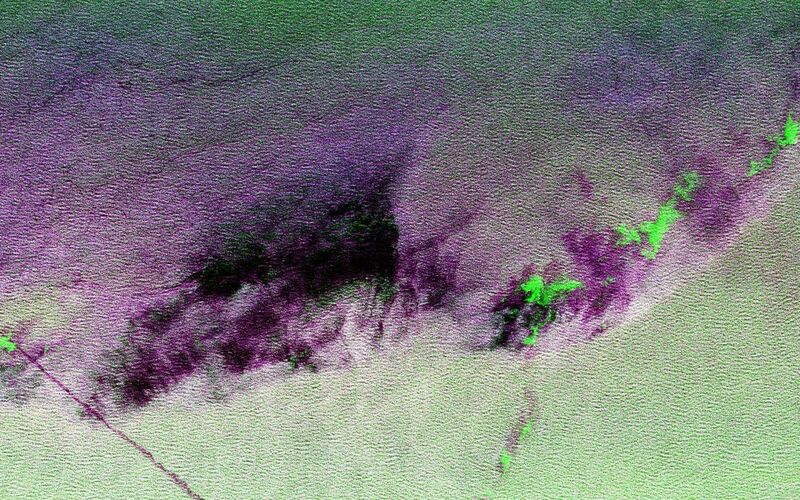 The dark patches are smooth areas of low wind, probably related to clouds along the front, and the bright green patches are likely due to ice crystals in the clouds that scatter the radar waves. The overall "fuzzy" look of this image is caused by long ocean waves, also called swells. Ocean radar imagery allows the fine detail of ocean features and interactions to be seen, such as the wake, swell, ocean front and cloud effects, which can then be used to enhance the understanding of ocean dynamics on smaller and smaller scales. The image is centered at 42.8 degrees north latitude, 26.2 degrees west longitude and shows an area approximately 35 kilometers by 65 kilometers (22 by 40 miles). The colors in the image are assigned to different frequencies and polarizations of the radar as follows: red is L-band horizontally transmitted, horizontally received; green is C-band horizontally transmitted, horizontally received; blue is L-band vertically transmitted, vertically received. This image was acquired by the Spaceborne Imaging Radar-C/X-band Synthetic Aperture Radar (SIR-C/X-SAR) imaging radar when it flew aboard the space shuttle Endeavour on April 11, 1994. SIR-C/X-SAR, a joint mission of the German, Italian and United States space agencies, is part of NASA's Mission to Planet Earth.